The first novel by renowned science popularizer Annalee Newitz is both extremely funny and unfussily violent. 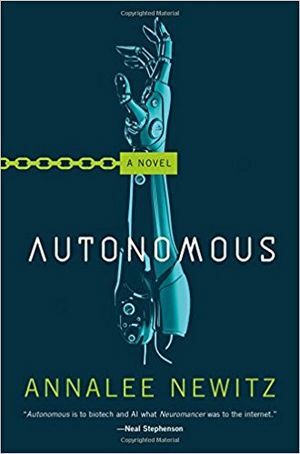 The humor and casual brutality of “Autonomous” overflowed my buffers. That’s a very technophilic way of phrasing what I mean. To restate in more customary-to-human terms, this first novel by renowned science popularizer Annalee Newitz is both extremely funny and unfussily violent; combined with her well-honed writing skills, those qualities kept me from questioning too deeply the parallels she points out between intelligent robots and human slaves — at least while I was reading it, and so far for two days afterward. Paladin and Jack are the main characters in “Autonomous,” and its plot revolves around the pursuit of drug-hacker Jack by Paladin, a robot created and owned by the sinister International Property Coalition. Chapters alternate between Paladin’s viewpoint and that of 50-plus-year-old Jack, a human freelance pirate who reverse-engineers patented medicines such as an anti-aging serum called Vive — sometimes for profit, but mostly to hand out free to those who can’t afford them. Jack’s discovery that a work-enhancer she copied was deliberately designed to be addictive triggers a planet-wide search-and-destroy mission on the part of Paladin and human IPC agent Eliasz. Jack’s an enthralling and believable character, tough and likable. Her ethical urges clash with her sexual imperatives, and her completely understandable actions inevitably spawn regrets. Paladin is just as engaging, not least because of the bumbling nature of their coming to competence and, eventually, to the autonomy of the book’s title. Assigned masculine gender on manufacture, they allow Eliasz’s sexual attraction and the feminine gender of their human brain’s previous owner to effect a reassignment; though gender, as Paladin points out, is meaningless to robots, they learn to identify as a woman. Other intriguing characters include Medea Cohen, a “biobot” raised autonomously by human parents; and Threezed, a human indentured and sexualized as a child. Sadly, despite his presence through multiple chapters, Eliasz remains pretty much an affectless cipher. This adds to the already problematic nature of his romance with Paladin by undercutting any imaginable allure. The relationship between Eliasz and Paladin unmistakably evokes that of overseer and slave in the antebellum U.S. South: both work for the IPC, but Eliasz commands and Paladin obeys; Eliasz has exclusive access to his own memories, while Paladin’s are shared with the robot’s owner; programs named “gdoggie,” “masterluv” and “objeta” mandate the robot’s love for the human, creating a power differential similar to the one operating in historical situations. Despite Paladin’s reflections on an obscure moment of choice Eliasz offered them, there’s no forgetting the sexual intimacy the human indulged in with them before granting the robot even temporary autonomy. Though this flawed facet of Newitz’s debut novel stayed with me long after its end, so, too, did her gutsy mix of existential ideas and adventures: submarines, pirates and radical science for the win! Nisi Shawl is the author of Nebula Award finalist “Everfair,” a steampunk novel set in the Congo during the reign of Belgium’s Leopold II.